Uniting our community of communities around Cambridge's Mill Road. We are indebted to the Over Mill Road Bridge website for this update: GTR promises temporary footbridge during bridge closure. Govia Thameslink Railway (GTR) has promised to instal the footbridge to allow pedestrian access between the areas of Romsey and Petersfield when Mill Road Bridge is closed for railway works beneath it in 2019. I welcome the recent news that ‘Govia Thameslink Railway and Network Rail’ have agreed a temporary footbridge during the Mill Road Bridge closure. The seeds for this agreement were sown at their initial public meeting in the ‘Double Tree by Hilton Hotel’ in Granta Place on 1st November last year, where the proposal was put cogently and sensibly by representatives of the ‘Mill Road Traders’ Association’ and ‘Camcycle’, together with several residents of the Mill Road Area. The ‘Thames Govia’ Managing Director, accompanied by a Chief Engineer for the project, listened attentively and recorded the contributions; and at subsequent open meetings in Mill Road the Company took on board further ideas for the construction, positioning and design of a temporary bridge in that location. It is good to know that a balanced democratic approach has worked so well and, in my opinion, would have probably achieved this welcome result without making it into a Local Party Political Issue! Received by email at our contact email address, 11/01/2019. Could there be a silver lining to the closure of Mill Road Bridge to motor vehicles in 2019? The idea of reducing the amount of motor vehicle traffic on Mill Road has been much discussed in recent years. Benefits could include reduced pollution, safer cycling and walking, more reliable bus services and a more pleasant environment in which to live, work and shop. But we’re all conscious of the potential downsides – eg the impact on traffic in surrounding roads, the inconvenience for private motorists in particular for disabled drivers and the elderly, and logistical problems for bulk deliveries to the shops and business on Mill Road. The financial cost (or benefit) of reduced traffic on local shops and businesses is also unclear. So given that the bridge has to be closed to vehicles for at least 8 weeks in 2019, there’s clearly an opportunity to better understand the impact of reducing traffic on this key Cambridge thoroughfare. Add your own comments (pre-moderated) below. Or below the A traffic-free Mill Road? post. See also updates on the Over Mill Road Bridge petition website, set up by Romsey & Petersfield Labour Parties. Mill Road Bridges is non-political and non-aligned but we welcome people of any political party (or none) and any religion (or none) who are sticking up for Mill Road. And do sign the petition. Sophie Barnett one of our Romsey City Councillors has invited Network Rail to a meeting with Romsey and Petersfield Councillors. She is waiting for a response. The Councillors will want to ask how Network Rail and Govia Thameslink can address resident and business concerns about the impact of the Bridge closure. Noel Kavanagh, Cambs County Councillor for Romsey, has asked about the process Network Rail will follow to get permission to close the Bridge. They will need to apply for a Temporary Traffic Regulation Order (TTRO). Cambs County Council will publicise the Order, but there is no public consultation. So there is no direct consideration of public objections to the closure. We’ve asked Noel if he can find out how Cambs County Council will assess the TTRO application. We’re assuming the application will need to meet some criteria – what are they? Drop in meetings – Earl of Beaconsfield Tuesday 27th November 13:00 – 20:00 – Report-back. Mill Road Bridges Treasurer, Richard Wood, attended one of these sessions, at which he was able to speak to GTR’s Kevin Parker, Head of RailPlan2020, a representative of Network Rail and of the contractors, Spencer Group. 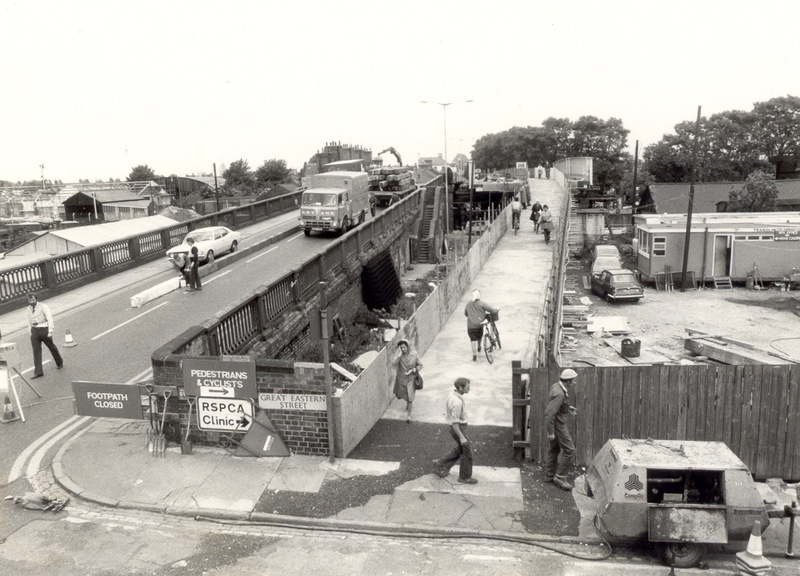 Reference was made to the rebuilding of Mill Road Bridge as part of the 1980s electrification programme, to accommodate the overhead electric line equipment. The bridge from Great Eastern Street looking towards Petersfield. Courtesy of John Hullock and the Suzy Oakes Collection. The concerns of traders were raised. All of Mill Road’s independent traders have considerable custom arriving by foot and cycle, however some sell £100s of their speciality goods to customers using motor vehicles. The point was made that ‘This is Mill Road, Cambridge’ – we’re all only a couple of degrees of separation from somebody with engineering expertise. If Mill Road bridge is to be closed to motor traffic – disrupting all deliveries and some trade to shops, and severing our bus service – GTR and Spencer Group will need to show us precisely why the bridge cannot be kept open through the works, in a way that can be closely scrutinised by those in the community with the relevant skills. Otherwise Mill Roaders will assume that the wool is being pulled over our eyes. Things do appear to have moved on since the meeting on Thursday 1st November, in – ahem – Mill Lane. GTR are now looking to do the works later in the year July/August 2019, taking account of the feeling amongst traders that this would have less effect on trade than May/June. Local parents pointed out that July/August would be less disruptive to parents/pupils of (particularly) St Mathew’s and St Philip’s primary schools, and to pupils/staff of Cambridge Academic Partnership – responsible for secondary schools at Parkside, Coleridge and Trumpington. Our understanding is that GTR promised to consult local schools and to take account of school term/holiday dates. In the leaflet (reproduced above) GTR say, “We are looking to provide planned periods of pedestrian access throughout the period,” which implies a lack of commitment to continuous pedestrian access and makes no mention of cycle access. Our understanding is that GTR and Spencer Group are currently planning the design and installation of a pedestrian bridge. It is not clear, at this stage, if cyclists will need to dismount. It appears to be the case that such a bridge will be open through any closure of the bridge to motor-traffic, save for short periods where it cannot remain open for reasons of engineering and public safety. Cambridge Cycling Campaign would like to see temporary enhancements to the public realm, during any closure to motor-traffic. In particular, hiring and installing pre-assembled ‘parklets’. See their vision for Mill Road with no through-traffic. Our understanding is that GTR will be meeting with Cambridge Cycling Campaign to discuss there ideas and their concerns. Mill Road Bridges Treasurer, Richard Wood, joined with Cambridge Area Bus Users Secretary, Richard Wood, in stressing the importance of providing substitute bus links in the event of closure of Mill Road bridge to motor-traffic. We were assured that GTR are in discussions with Stagecoach East over providing a substitute service. Our understanding is that any proposed timetable will be open to public consultation. The usual diversionary route for citi2, when Mill Road is closed (eg for Mill Road Winter Fair) is via East Road, Newmarket Road , Coldhams Lane and Brooks Road, resuming its normal route to Addenbrooke’s Hospital via Perne Road and Birdwood Road. Below are personal suggestions, please add your own comments, below the line. On the Petersfield side, a previous bridge closure has seen a link bus service routed city centre – Mill Road – Tenison Road – St Barnabas Road and return, with Gwydir Street inbound and outbound stops suspended. With the bridge closed, a temporary stop on Mill Road outside St Barnabas Church (city-bound) would be feasible. Both Tenison Road and St Barnabas Road are, technically, wide enough to take any standard HGV or bus, although a smaller vehicle (eg Optare Solo) might be more manageable. Because of congestion in Emmanuel Street, it is a moot point whether such a service should terminate in the city centre, or continue on the remainder of the route to Cambridge North Station via Chesterton. On the Romsey side of Mill Road a Hope Street – Argyle Street – Cockburn Street loop might be possible. Again, a smaller bus might be advisable, and some parking suspensions might be required in those side streets. Mill Road Broadway inbound and outbound stops would need to be suspended and replaced with a temporary stop outside Mill Road Tesco. A 20-min frequency Romsey Town – Perne Road – Birdwood Road – Addenbrooke’s, service would match the existing service to Addenbrooke’s. This might be supplemented with a 20-min frequency Romsey Town – Brooks Road Sainsbury’s – Coldhams Lane – Newmarket Road – East Road – city centre – Chesterton – Cambridge North Station. The schedule might be completed with a a 20-min frequency Addenbrooke’s – Birdwood Road – Brooks Road Sainsbury’s- Coldhams Lane – city centre – Chesterton – Cambridge North service. For updates from GTR, register on the Thameslink Programme website, or you can raise issues directly with GTR at contact@thameslinkprogramme.co.uk. The timing of the meeting had been controversial with Mill Road’s traders, as it was in the week leading up to Mill Road Winter Fair on Saturday 1st December 2018 – probably the worst time for Mill Road’s Traders. We have managed to secure a room at the Beaconsfield Arms on the 27th November. Many apologies – I know you said it was too close to the Christmas Fair but the room had been sourced and it was the only day that everyone could do. It will be in the form of a drop-in from 13:00 through until 20:00, which hopefully will mean people will be able to pop in at a time convenient to them. I wonder if you have a list of the members of the traders association? We will try as much as possible spend local and it would be useful to know who the local suppliers are and who to contact. Thank you for your email which was sent to Piero, I am very glad that we are working on some sort of solution. As you may not be aware, we are at this moment in time in the run up to preparations for the Mill Road Winter Fair which is a very important event on our annual calendar and for our local community. As discussed on previous occasions the date initially suggested of the 21/22 of November was suitable but that has now been changed by you and after discussing this with a number of traders the suggested date of the 27th by you is not convenient for the traders, we would prefer to postpone the meeting until after the Mill Road Winter Fair and if possible at a more appropriate venue. I’d like to suggest either St. Barnabas Church or The Salvation Army on Mill Road as an alternative venue. Whilst we accept that you have the right to hold the meeting whenever you want, we would rather you don’t include the traders in the programme or literature of the drop-in session. I’m a CamCycle volunteer helping out with our Mill Road campaign. I am pleased to see that you have published Martin Lucas-Smith’s article about our vision for Mill Road with no through-traffic, which would allow more room for pedestrians, cyclists and delivery vans, reduce congestion, improve air quality and make the street a more pleasant destination. We think the closure of the bridge next summer is a great opportunity to trial elements of our vision. We would love the Mill Road community’s input, and would appreciate Mill Road Bridges being involved in this process. We are holding two drop-in public consultations over the coming weeks to gather the views of residents, traders and visitors to Mill Road. It would be great if these two events were to attract a large attendance by a lively crowd to further the debate. As Friday 2 November 2018 appears to be the deadline for submission of objections to the Govia Thameslink Railway and Network Rail planning application, our treasurer submitted an objection Mill Road bridge works 18:1372:CAP18 objection (PDF 49 KB) asking that conditions be imposed on the applicants to ensure maximum access from the Romsey ward to the east of the railway bridge to the Petersfield ward to the west at the bridge location. Easy access for pedestrians and cyclists is the most essential for the viability of the independent traders for which Mill Road, Cambridge, is justifiably famous, and of which the community is justifiably proud. The greatest volume of sales from Mill Road’s shops is to customers who arrive on foot or by pedal-cycle. Govia Thameslink Railway (GTR), Network Rail and its contractors hosted a public meeting at the DoubleTree by Hilton, Granta Place, Mill Lane, Cambridge, CB2 1RT at 6pm on Thursday 1 November 2018 to discuss the proposed eight-week closure of Mill Road bridge in Cambridge from May 2019. Why it was not held at a venue on Mill Road we do not know. Was it to make things difficult? Or did no-one at GTR realise that Mill Lane and Mill Road are not adjacent locations? The meeting was announced in Rail Business Daily, on-line. 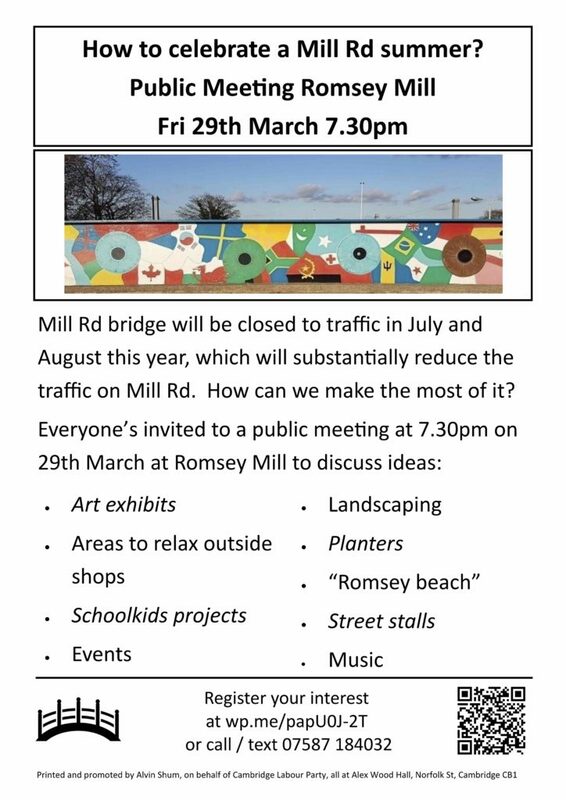 We are indebted to Cllr Dave Baigent, City Councillor for Romsey, to alerting the Mill Road community to this meeting, on Twitter. Our treasurer raised his frustrations at the poor responses from Network Rail and Govia Thameslink Railway to our request (see below) to be kept informed. Whilst Network Rail did contact him, he had no response from Govia Thameslink Railway. Neither they nor Network Rail informed him of this meeting. An apology was forthcoming but how did this occur? Will the bridge remain open for pedestrians and cyclists? What linking bus services can be provided along the two sections of Mill Road? 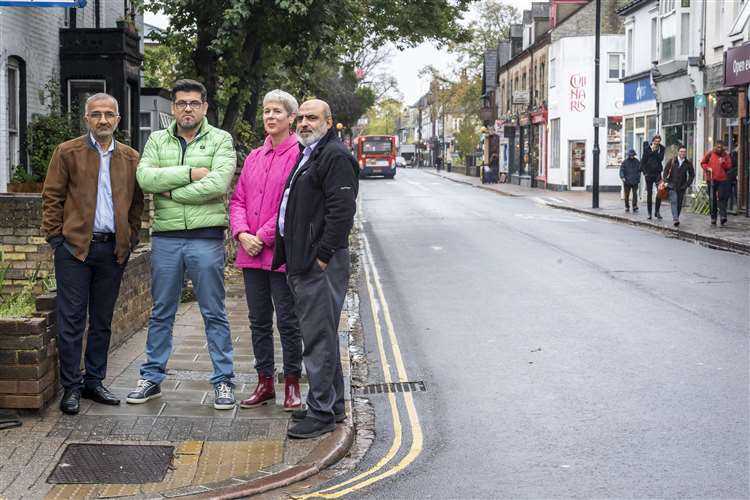 What will be the impact on Mill Road’s independent traders? The bridge will have to close for two months to allow work to expand the railway below, which will require modification of one of the bridge’s arches. The work will allow an additional railway line to run beneath the bridge, but will make the bridge unsafe for traffic while this is taking place. A GTR spokesperson said: “We are planning a £30 million extension of the Cambridge railway depot to help increase the number of Thameslink services to and from the City. We have contacted Network Rail and Govia Thameslink Railway asking to be included in all consultations. 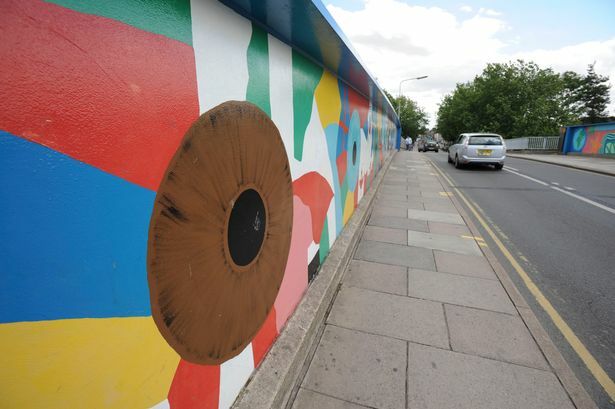 We understand that Mill Road bridge in Cambridge is scheduled to be closed to all motor traffic from May to July 2019, in connection with installing an additional rail line beneath the bridge for access to an expanded maintenance depot for GTR trains. Please ensure that our community organisation – Mill Road Bridges – is included in all consultations. Our main concern is that the bridge will remain open for pedestrians and cyclists between the two sections of Mill Road in Petersfield ward to the west of the railway and in Romsey ward to the east. Failure to ensure pedestrian and cycle access at all times will impact severely on the independent traders for which Mill Road, Cambridge is justifiably famous, and of which the community is justifiably proud. This will be essential data for planning a positive outcome for more permanent traffic reduction along Mill Road, a reduction of congestion, an improvement in air quality on the Mill Road corridor, safer cycling, amore pedestrian-friendly environment, bus service reliability, whilst minimising disruption to traders and residents. I’ve not been able to go to any of the meetings about the proposed closure. This isn’t a complaint by the way, I was simply not available. I’ve been pleased to hear that there will be a separate bridge available for pedestrians and cyclists to use during the closure. Is this correct please? If it is, I’d like there to be a seat in the middle like there is on the wider paved side of the bridge as this is of great help for those of us needing a rest whilst walking across it. I got the leaflet today – the first I’d heard of the closure. I agree they need to find ways to maintain pedestrian access over the railway. The railway bridge ‘closure’ provides Mill Rd with a once-in-at-least-one-generation opportunity to ‘trial a change’. The temporary change must be big enough to tell us something, but not so big to be unrealistic to continue with in some form, and we collect the right data to have a debate about what next, not a debate about the data. If we identify and roughly rank the Mill Rd transport problems, through-traffic, that adds nothing to local business and isn’t residents, would seem to be is the highest priority to ‘see what we can do about it’. The bridge closure gives us that opportunity, but it must be supported by a properly designed study that starts by deciding what questions it wants to answer (e.g. where is motor traffic displaced to, how much traffic evaporation takes place, how does foot and bike use change, what happens to air quality, trader figures), and then collects data to answer those questions (so not collect data then see what it tells you!). With motor vehicles not being able to cross the bridge, there will be some change to resident behaviour car-borne, again we need to know how much and need to design that in. We could go further, and by using plate recognition, build up data that told us how much residents, delivery, incoming visitors, are moving about at different times. That could then be used to answer questions about the effect of evening ‘street scene’ speed limit changes or temporary rerouting, delivery time restrictions or even bigger delivery windows. Of course the severing of a bus route is problematic; it is a change that is too extreme to suggest that it would remain after reopening. The answer is to run something as close to a replacement as possible (perhaps minibuses from Perne Rd to the foot of the bridge and from the Petersfield foot to the other end, with an electric shuttle cart crossing the temporary bridge – I would hazard that even that complexity is no slower than the bus most of the daytime. After that, the data need to be publicly available (but anonymous of course), the analysis and presentation needs to be open and peer-reviewed. In summary then, we need to design the data collection with our questions in mind, we need to put in temporary solutions to the things that wouldn’t form part of any proportionate plan in the future, and we need an open process where we can play around with the data and ask “what if”. Finally, ‘evidence’. I realise that the traders association is concerned about a drop in revenue. My profession is not this kind of thing, although it is in evidence for decision-making that has similar challenges, but I lived in Whittlesey 25 years ago when something similar on a much smaller scale was proposed for the high-street, and it was the case then that all the properly conducted and peer-reviewed studies showed that when motor traffic was reduced and other transport forms increased, revenue went up. That to me right now seems an easy win – get a research group to provide the evidence – to review all the papers if they haven’t already, and tell us what the evidence says. Then design the Mill Rd Bridge Closure experiment, in the same way. I’m not an advocate of any outcome, but I do know that the peer-reviewed evidence on the effects of air quality and noise on human health are compelling enough to warrant a significant investment in getting the data we all need to make an informed community decision from this once-in a generation opportunity. I realise that many will be badly burnt from the last data-to-solution exercise; I am proposing something different – decide what questions we want to answer, not what solutions we envisage, then collect data to answer the questions, be they ones about traffic or air quality or trader figures or perceptions. Then let’s play around and see what it can tell us and we can avoid any of us promoting a solution without fully understanding its impacts. In reply to Steve Gibson. This seems like a good idea. Once we are able to sit down and talk with TGTL to find out more detail of what is happening in response to the earlier meeting and negotiate the best outcome, then we can look at what can be organised in the way of research. You seem pretty switched on in these matters so perhaps you would like to lead a group working on this? What do you think? I’m sadly not surprised but am disappointed to read all about the needs of cyclists and pedestrians yet see no mention of people with disabilities or other vulnerabilities in either the proposal or the response from the Mill Road group. Those of us who rely on the bus service up and down Mill Road (despite the expensive tickets), are unable to cycle and cannot walk for long or very far will now be faced with the prospect of paying for taxis which are even more costly or of staying at home. This will have a huge impact on the independent Mill Road traders. I would hope they can at least offer a pedestrian and cycle temporary bridge? Will we be informed of compensation for loss of takings while this is taking place? In reply to Paul Weaver. That is far from true. City Councillors are concerned about everyone. We are still trying to get a meeting with them. R on Community, or car park? L on Community, or car park? Madeleine Loewe on A traffic-free Mill Road? Dave4 on Community, or car park? Update Dec 2018 | FeCRA on Hooper Street chestnut trees – Result! Janet Wright on Hooper Street chestnut trees – Result! Anna on Hooper Street chestnut trees – Result!